In our first science-as-a-service post, I highlighted some of the participants in the ecosystem. In this one, I want to share the changing face of funding. Throughout the 20th century, most scientific research funding has come from one of two sources: government grants or private corporations. Government funding is often a function of the political and economic climate, so researchers who rely on it risk having to deal with funding cuts and delays. Those who are studying something truly innovative or risky often find it difficult to get funded at all. Corporate research is most often undertaken with an eye toward profit, so projects that are unlikely to produce a return on investment are often ignored or discarded. If one looks to history, however, scientific research was originally funded by individual inventors and wealthy patrons. These patrons were frequently rewarded with effusive acknowledgements of their contributions; Galileo, for example, named the moons of Jupiter after the Medicis (though the names he chose ultimately did not stick). There has been a resurgence of that model — though perhaps more democratic — in the modern concept of crowdfunding. Kickstarter, the most well-known of the crowdfunding startups, enables inventors, artists, and makers to source the funds they need for their projects by connecting to patrons on the platform. Contributors donate money to a project and are kept updated on its progress. Eventually, they may receive some sort of reward — a sticker acknowledging their participation or an example of the completed work. Scientists have begun to use the site, in many cases, to supplement their funding. Anyone can be a micro-patron! 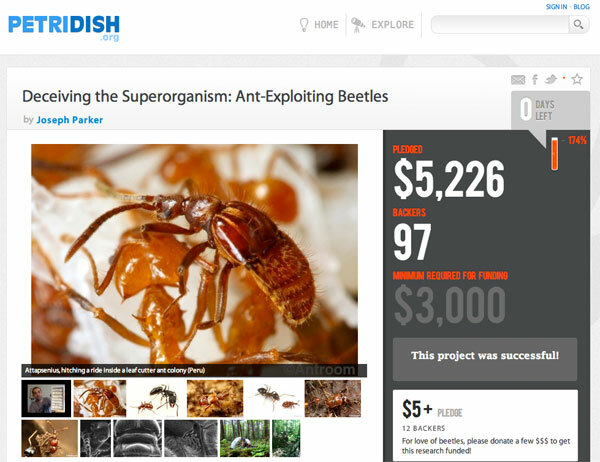 “Deceiving the Superorganism: Ant-Exploiting Beetles” met its goal through Petridish, a funding site. Science-specific platforms have also appeared on the scene. Petridish is currently showcasing projects looking for funding to study everything from rare butterflies to mass-fatality events. On Microryza, you can fund investigations into cannibalism in T-Rex or viral causes of lung cancer. RocketHub also has a science-specific project roster and recently had a researcher raise funds to study the psycopharmacology of amphetamines. Widely covered as “Help scientist build a meth lab,” the researcher’s write-up of his proposal, including his reasons for crowdfunding it, is excellent and worth a read. And newcomer Iamscientist is combining fundraising help with a community, KnowledgeXchange, which helps researchers to recruit team members and find mentors. While these sites show great promise, several similar platforms founded a few years ago have failed. The extent to which this new crop is popularly adopted remains to be seen, though the excitement around crowdfunding may indicate the time is now right. While anyone can submit a project to the sites above, there are also hybrid models that enable individuals to “top up” more traditionally funded research. In the UK, MyProjects enables individuals to fund research targeting specific types of cancer; the underlying projects have already been pre-approved and funded by Cancer Research UK. The process is more specific than traditional charitable giving, so contributors feel that they’re making a difference in a specific area that matters to them. The American Association for the Advancement of Science has begun to teach its members about crowdfunding. For more expensive research, of course, micro-patronage falls short. Breakout Labs, run by the Thiel Foundation, has begun awarding grants of up to $350,000 to “to fill the funding gap that exists for innovative research outside the confines of an academic institution, large corporation, or government.” In exchange, the company retains the rights to its IP, and Breakout Labs is given a percentage of future revenue and an option to invest in an equity round. Under the traditional grant model, the average researcher spends up to 40% of his or her time chasing funding, and 80% of grant applications are rejected. In addition, the necessity of ties to an academic or industrial organization means that researchers don’t retain control of their IP. The new models of funding can speed up the process, while enabling scientists to keep 100% of their research and results. They also enable citizen scientists to publicize their projects and built communities of involvement. If you’ve participated in funding scientific research via one of these platforms, or are a scientist who has run a campaign on a crowdfunding site, we’d love to hear your thoughts on the experience in the comments below.